On April 24, 2019, faculty, students, staff, and the local community are invited to the University of Notre Dame for the Eck Institute for Global Health event, “The Importance of U.S. Leadership in Global Health: A Conversation with Admiral Tim Ziemer.” The event, which will begin at 4:00 p.m. in Washington Hall, aims to educate the public on the vital role the U.S. government plays in the advancement of global health. 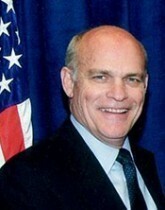 At the event, attendees will hear from Admiral Tim Ziemer, the acting assistant administrator for the Bureau for Democracy, Conflict, and Humanitarian Assistance at USAID. Ziemer will join Nahlen in a discussion about the variety of ways the U.S. government supports global health efforts in developing countries as well as how the University supports these efforts. Afterwards, a reception for graduate students, faculty, and staff will take place at Hurley Hall. For full details about the event, please visit https://globalhealth.nd.edu/news-events/events/2019/04/24/the-importance-of-u-s-leadership-in-global-health-a-conversation-with-admiral-tim-ziemer/. Originally published by Brandi Klingerman at globalhealth.nd.edu on April 10, 2019.